Background: Phytol have various pharmacological activities such as antimicrobial, cytotoxic, antitumoral, antimutagenic, anti-atherogenic, antidiabetic, lipid-lowering, antispasmodic, antiepileptic, antinociceptive, antioxidant, anti-inflammatory, anxiolytic, antidepressant and immunoadjuvant. 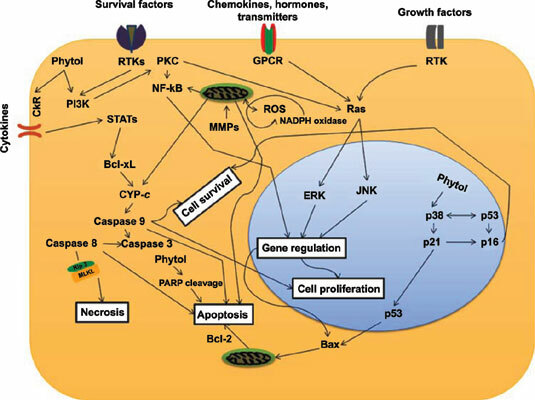 Several studies point to an association of phytol with implications for apoptosis and necrosis at cellular levels in cancer, yet no clear conclusions were drawn. Method: To clarify this, we conducted a meta-analysis of non-clinical studies of phytol and its associations with toxicity and cytotoxicity emphasizing the mechanisms of apoptosis and necrosis induction and its importance in tumor therapy. Relevant studies were systematically searched in PubMed and Web of Science. The association between phytol and cyto-/toxicity was assessed by odds ratio (ORs) and 95% confidence intervals (CI). Twentythree studies were finally included in the meta-analysis. A significant association between phytol and toxicity (OR: 1.47; 95% CI = 0.86–2.48) was found among in vivo studies and cytotoxicity (OR: 1.81; 95% CI = 1.12– 2.65, p<0.05) in in vitro and ex vivo studies. In in vitro studies, 24% of them indicate that phytol at high doses induces apoptosis by several mechanisms; while about 40% of ex vivo studies indicate that phytol induces reactive oxygen species generation. But, Phytol does not act as a direct oxidant, unlike its metabolite phytanic acid. The 24% of in vivo studies also highlighted the mechanisms for apoptosis-like including expression of Bcl2 protein or mutations in pro-apoptotic protein Bax. Of them, 8% studies show necrosis and hepatotoxicity. However, in 24% of the articles, the mechanisms of toxicity and cytotoxicity are still not well elucidated. Conclusion: This study confirms that the association between phytol and cyto-/toxicity depends on the dose/concentration used in the given experimental conditions. Thus, there are still great prospects for new research aimed at the use of phytol and its metabolite as anticancer agents. Phytol, toxicity, cytotoxicity, apoptosis, necrosis, anti-tumoral.